I remember a time when ghee was vilified as heart clogging, dangerous and to be avoided at all costs. A staple in authentic Indian cooking, it certainly added to the guilt of an Indian take away. Fast forward a couple of decades and now ghee has risen to ‘superfood’ status and is slowly gaining a glowing reputation as an elixir for health. Before I consider whether it justifies this status, it may be that you have yet to discover ghee and are in the dark as to what it actually is. 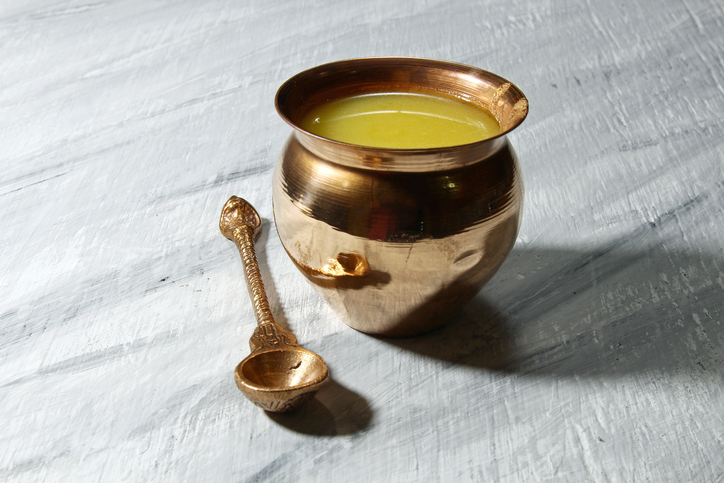 Ghee is essentially clarified butter that is stable at room temperature. It gets this way because the butter has been gently heated so that its components separate. The liquid (water) evaporates allowing the butter fat to be poured off from the top, leaving the milk solids, which have settled at the bottom. The fat is then used in cooking. It is a pure fat that is free of harmful preservatives, additives and even salt. The source of the butter, whether clarified or not is also important. 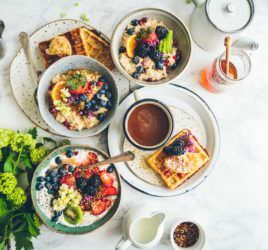 As with all dairy foods, my recommendation is to choose organic or grass fed sources as far as possible so that you can reduce your exposure to hormones, antibiotics and perhaps even pesticide residues in the feed. Good quality ghee tends to be made from grass-fed cows and therefore less harmful. If you’re still worried about including ghee in your diet, here’s why you should. As with butter, Ghee has gained a bad reputation due to its high saturated fat content and its contribution to an increased risk of developing heart disease. 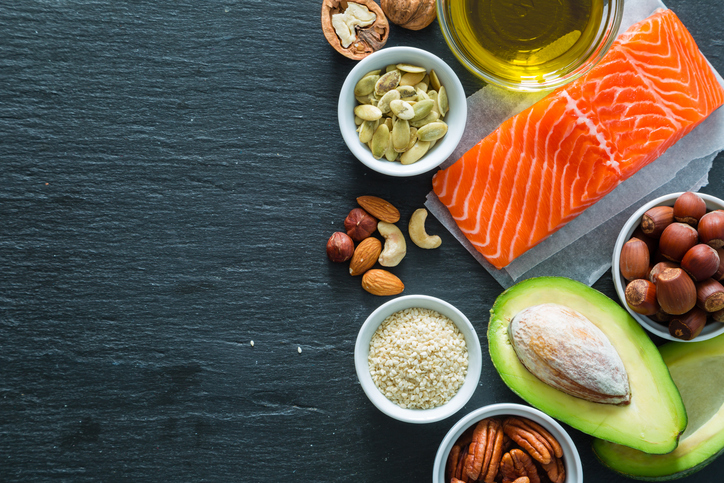 However, recent research has now confirmed that saturated fats, including ghee, are not responsible for this increased risk and in fact, can actually play a role in reducing the risk of heart disease. Ghee is particularly high in Vitamin A, a powerful antioxidant vitamin that can help with immune function, vision and fertility. Vitamin E, also a powerful antioxidant, can help to reduce signs of ageing and promote healthy skin. Milk fat found in ghee is a rich source of Conjugated Linoleic Acid or CLA; which is a powerful antioxidant that is anti-inflammatory and can protect against cancer and heart disease. Plus it is a rich source of the fat-soluble vitamins A, D, E and K.
It is high in butyrate or butyric Acid, which is a short chain fatty acid that can reduce inflammation and improve gut health, potentially improving symptoms of irritable bowel syndrome. As a fat, ghee does not contain the milk solids, it is almost lactose and casein-free, which can make it a better choice for those with intolerances to these than butter. It is made up of medium chain fatty acids, making it easier to digest. Ghee is an easy substitute for butter. Plus it has a higher smoke point than butter, olive oil or coconut oil, which means that it will stay stable at higher temperatures and less likely to oxidise and produce dangerous free radicals. It is therefore ideal for cooking, frying or sautés. As a saturated fat, it will remain stable and can be stored for longer periods – up to three months if stored in an airtight container. This is also because the perishable milk solids you’d get in butter have been removed. Plus, its nutty, more intense taste makes it flavoursome so a little goes a long way when you cook with it (it really does make food taste incredible). Use a tablespoon to make a batch of homemade popcorn Ghee will tolerate the high temperatures needed to make popcorn successfully. Fry an egg in this delicious alternative. Stir fry some vegetables with some ginger and garlic for a flavour-rich Asian side dish. Try using it to fry onions and garlic when making an Indian curry the aroma and flavour is amazing! Add vegetables such as spinach and cauliflower along with some Indian spices for a quick, flavoursome vegetarian supper. Use it instead of coconut oil or butter to make pancakes. For a delicious garnish, try quick frying a batch of nuts and seeds in ghee and sprinkle over a dip or soup. A word of caution….despite its many benefits, as a source of fat, Ghee is still high in calories and should be consumed in moderate amounts as part of a healthy diet.